Cream together butter and sugar. When smooth and creamy add vanilla, egg and pumpkin. Mix dry ingredients together and sift 2 times. Then add to pumpkin mixture mixing well. Add chocolate chips and optional nuts/raisins. 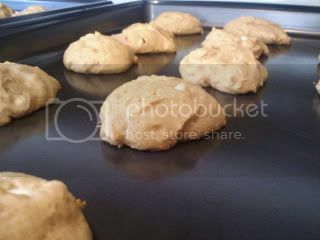 Drop by spoonfuls on cookie sheet. Bake at 350 degrees for 12 minutes. This recipe makes about 40 cookies. I used white chocolate chips, but you could use regular chocolate if you like - I didn't want the chocolate to overpower the pumpkin and I would really suggest using the white chocolate chips in this recipe. This was a hit at my recent fall family get-together from Cooks.com. My husband, who isn't a pumpkin fan even enjoyed these. This will become a fall staple in our household.